Of course everyone has a different style of cruising and a different boat with different issues and different requirements. Did I stress that word enough yet? “Different”. That means of course that your mileage may vary from ours. We spend very little time in marinas but we do occasionally visit one for leaving the boat. 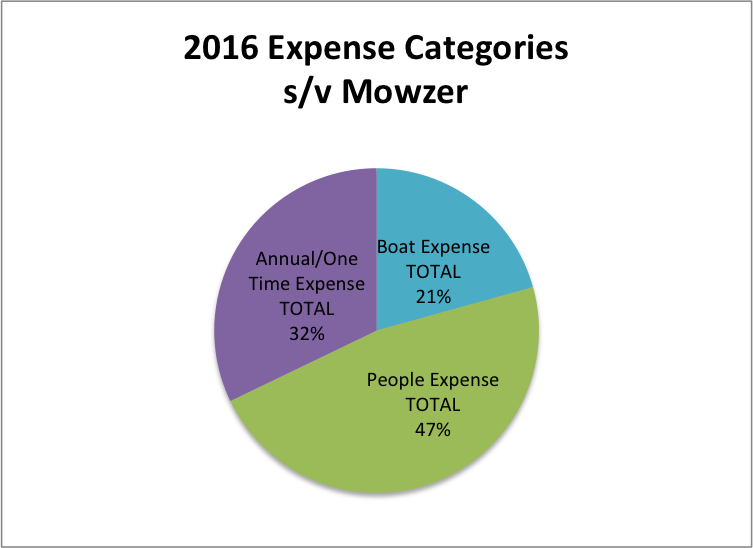 Other folks spend more or less time in marinas, and of course your cruising grounds will greatly impact cost. The Eastern Caribbean is not cheap - let me make that clear. Yes, we expect to pay less than $3 for our beer but boat parts are expensive and difficult to obtain, food can be cheap if you eat local provisions and fish along the way but if you have a yearning for some special treat expect to shell out for it. We eat out a couple of times a week, will happily partake in happy hour with drinks and will eat lunch out if we are running errands or hiking over the lunch-hour. And then there's communication (i.e. internet) costs. We often spend $70-80 a month but for those dollars only get about 5gb of data. Also for us this past couple of years has been difficult with the Canadian dollar falling in value against the US dollar. Remember that all those islands that use the East Caribbean Dollar are indexed to the USD so we are essentially spending USD most of the time. We know that there are many people out here who spend more than we do - and as I said at the start, that is a lifestyle choice. 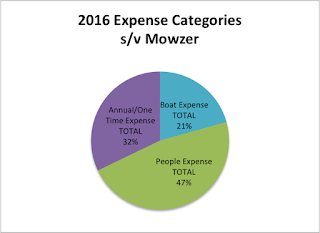 We also know that we could do this cheaper, but would we be happy and enjoying ourselves and would Mowzer be a comfortable safe boat? - perhaps not. There are many reports that you can live on ridiculously low amounts but I would hazard a guess that these reports are not from the East Caribbean, and perhaps their crew is just a little bit more salty than us. Please read through to the very end and then you can make your own decisions as to whether this information applies to you. 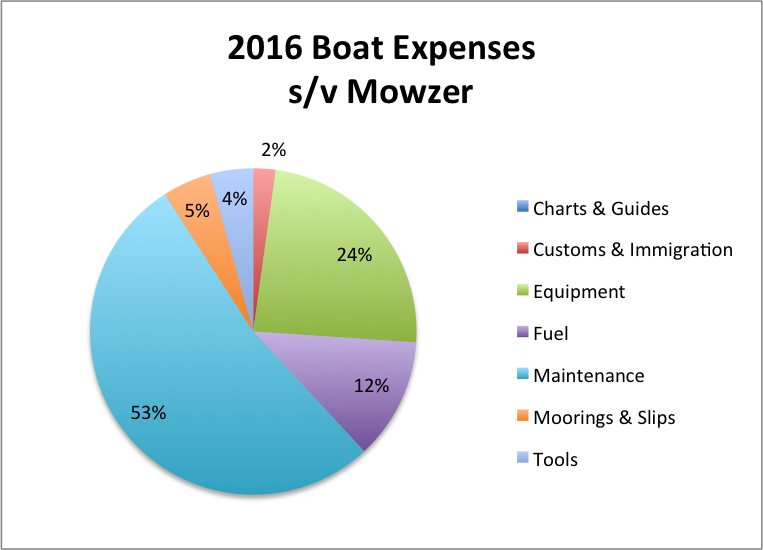 Within these main categories are further subcategories but our basic premise is that if we spend it on ourselves it is “People”, if we spend it on the boat it is “Boat”, and if it is a once a year or an otherwise non-recurring event we use the final category. Being Canadian, we actually run our numbers through conversion to the Canadian dollar - that’s how we have to pay our credit card bills and the currency of our bank accounts. However, given that most of the information you will find regarding costs and expenses on the internet are in US dollars, I have converted our numbers using the exchange rate in effect at the end of each month. 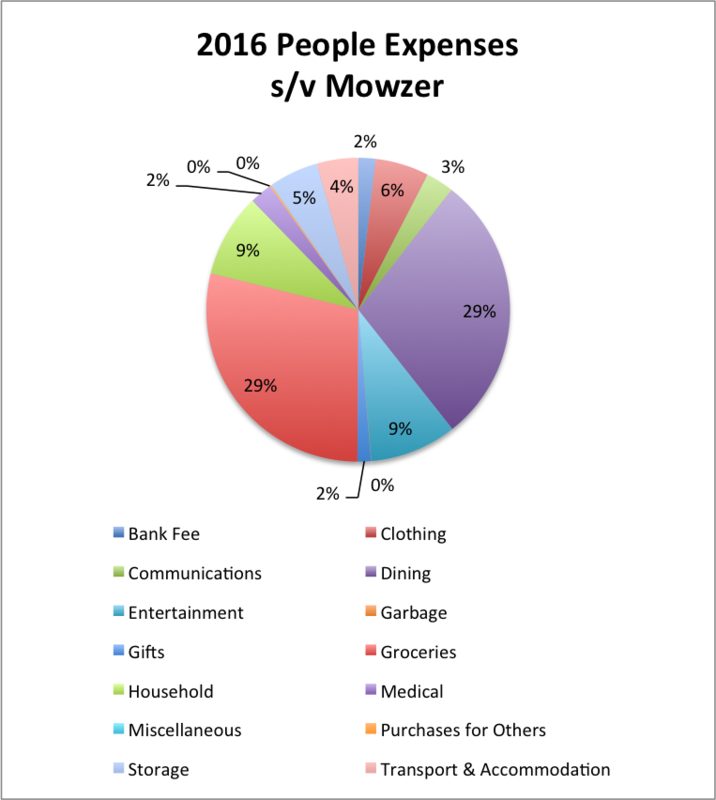 Annual budget is $60,000 USD and to be honest we spend a little more than this but are not too far off our budget. *Careful with our tracking = no miscellaneous expense. Okay - that's all good information that you can use if you are planning on sailing in the Eastern Caribbean soon. However, the Eastern Caribbean is made up of many island nations and each one will present a different spending experience. I was interested in comparing our costs between islands and also wanted to get some average numbers around daily spending. Careful, these data are in Canadian dollars. Are your eyes glazing over yet?? No worries, this is where it all comes together. In the timeframe we're reviewing we spent 193 days in Grenada (by far the most of any country) and our average people cost is $91 CAD ($67 USD) per day. Do we really walk around Grenada shedding that much from our wallets on a daily basis?? Well not really of course but it is quite customary to spend $350 on one shopping trip to the grocery store, the hardware store and the bulk supplies store. So here's what I was really interested in - a breakdown by country. These numbers are CAD so divide by 1.35 to get equivalent in USD. Remember - keep reading below the chart to get just a little more insight. SXM and Martinique are both major boat spending centres - this is where you get your annual and expensive repairs done. 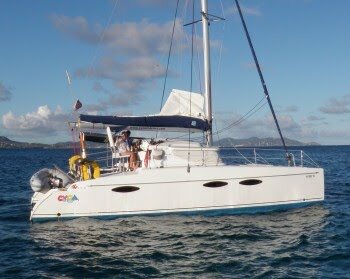 Antigua, St. Lucia & Grenada also have good chandleries so boat bucks are spent there as well. Montserrat, Dominica and SVG all look relatively inexpensive but major provisioning is done on the surrounding islands before/after going there. So that's it. What does this really do for me? Probably not a lot but it does help me be aware of the 'danger' zones and where our money can slip away. While we recognize that SXM is where we get most of our expensive boat shopping done, it is also a huge cruiser's gathering place and also home to the Heineken Regatta with lots of social time spent in bars and restaurants - perhaps this year we'll try to eat more on the boat! 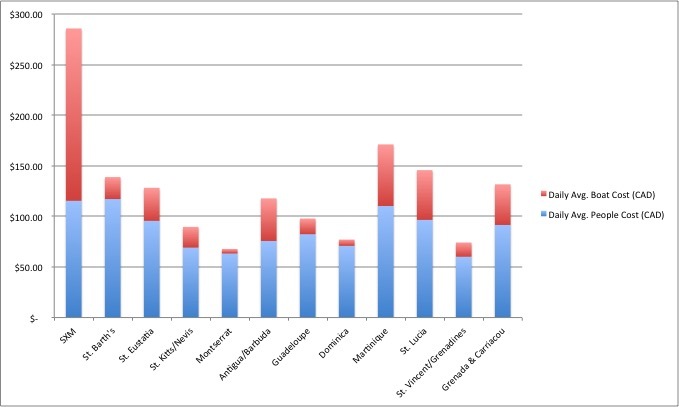 Just look at Antigua - lots of social and regatta time but we know that island is expensive so we've done a better job of controlling our costs there. Hope this might be helpful and please send any comments or questions our way. 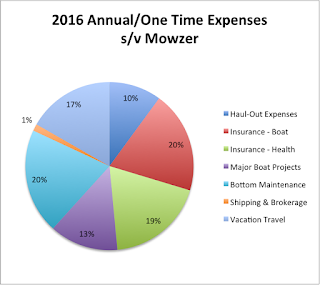 Thanks Susan - yes, we too were surprised just how much cruising costs and I think a lot of people don't like to share because of just that, and the fact we're just so shy to talk about money. We are very hopeful that the western Caribbean might be a bit cheaper than the eastern but I am sure as time goes on and more people go there, the prices will rise. Perhaps Cuba for the moment? Fair winds - Catherine. Hello Catherine and Henry, great post on an intersting topic. One really does have to make certain decisions about how frugally you want to live and how much you will allow your life to be focused around spending. Cruising is meant to be a relaxing and fulfilling change of life not a depravation experience, IMO. Regardless, it is amazing how the moneybflies out of ones pockets. I wonder how the ratios compare to how it was spent on land? Keep on writing, I enjoy your blog. Hello from everyone at CYOA. John. Hi John - great to hear from you and hello back to everyone at CYOA. You're absolutely right about money flying!! I truly believe that the lifestyle that you had on land is the lifestyle you bring to the water - by the time most of us are out here, our behaviours are pretty much ingrained. Catherine & Henry: We purchased our first boat, a Tanzer 26 in 2007 and sailed her during the summer on the Ottawa River. We then purchased Mowzer in 2009 and started off by getting into the charter business with CYOA. Over the next few years we spent our allotted time aboard learning as much as we could before we set off by ourselves. We finally 'cut the dock lines' as they say and moved aboard in October 2014. Catherine: Trained in Math & Comp Sci, worked most recently (15 years) in high tech as an HR systems architect, interested in photography, sewing (learning canvas repair), languages, hiking, snorkelling and wants to learn more about diesel engines. Henry: Trained as an Engineer and worked many years in high tech as a network planner, took a career turn and worked at Home Depot (as a job he could do anywhere in the world), interested in exploration, hiking, cooking, and sports.